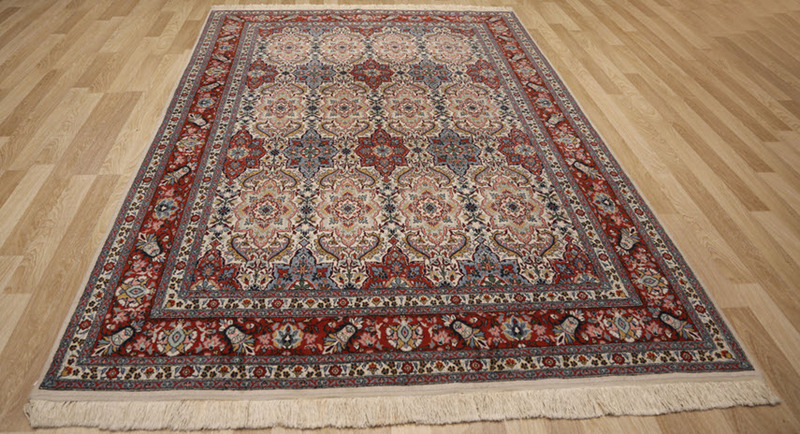 Although a silk rug is sensitive to abrasion, the individual fibers are extremely strong. It will not be as durable as a wool rug and cannot be placed in the same high-traffic areas, which is why we perform silk rug restoration often. Smart Choice knows the delicacy with which a silk rug needs to be handled. Our silk rug restoration process is professional and thorough, so you’ll get that gorgeous silk rug back just the way you remember it! A silk rug needs special care. These rugs are generally less durable than wool rugs, but don’t lose hope if your silk rug damage seems irreparable! Smart Choice can repair the fringe, edge or a tear or hole in a silk rug with techniques specifically designed for this type of floor covering. Wool moths don’t attack silk rugs although some other types of bugs do, so we don’t typically see holes and tears in silk rugs from these sources. The more common issues that we see with silk rugs are abrasion damage to the fringe and edges. The first step of your silk rug restoration is to dye the silk to the correct color, whether we’re repairing the edges, fringe, or pile. To repair a hole or tear, we carefully reweave the rug to recreate its pattern so the repairs are undetectable and long lasting. If the edges are unraveling, our experts use an overcast stitch like the one we would use for a wool rug with in same condition. The silk is dyed to match your rug and properly dried before being stitched around the damaged edge. 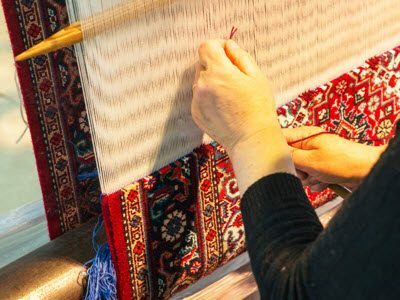 Fringe repair for silk rugs is similar in technique to wool rug repair as well, but there is one thing you need to watch out for with silk rugs: a company who will charge you for repairs done with real silk when they actually use art silk, a faux silk product. Silk comes from the cocoon of silkworms. These little silkworms are extremely picky and only dine on mulberry leaves. A single strand from a cocoon can be up to one mile long! Silk rugs – and the production of silk in general – originated in China. ‘Wild silk,’ that which is grown without human intervention, is called Tussah silk and is usually less expensive than silk that is cultivated by silk growers. This tedious process begins with raw wool that has been shorn from the animal and results in a beautiful, valuable, intricately woven piece of art!